Do you have a painful toenail digging into your toe? Do you have a painful toenail digging into your toe? Is it red, blistering, swollen? Have you noticed any drainage? You may have an ingrown toenail. An ingrown toenail is when your nail becomes incurvated and inflamed and/or infected. It can be quite painful and most of my patients have tried digging it out on their own before coming to see me. I don't recommend you doing any painful bathroom surgery with no sterile instruments! 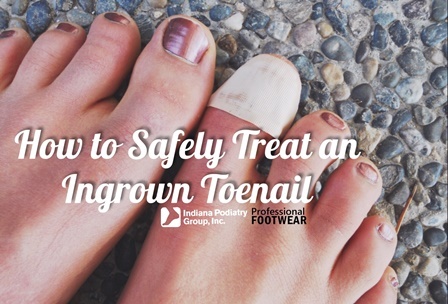 Instead come see us at Indiana Podiatry Group where we will evaluate you and perform a sterile procedure under local anesthesia to get rid of your painful ingrown toenail.